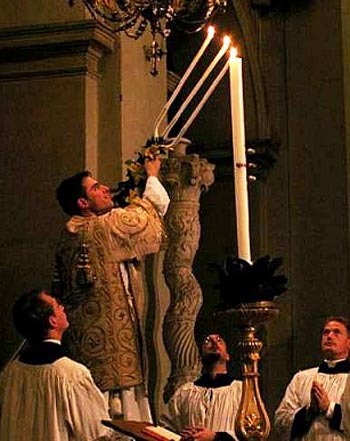 As the procession of clergy advanced into the church, the three candles were lit successively to honor each Person of the Holy Trinity; at each lighting the deacon sang the three-fold Lumen Christi and the choir responded Deo gratias, whereupon all genuflected. The final destination of the Procession was the sanctuary where the unlit Paschal Candle was already in place waiting for the deacon to light it from one of the three candles. This tripartite symbolism was calculated to make a lasting theological impact on the faithful. For those who were waiting inside the unlit church, this was a pinnacle moment, the climax to which the procession was leading. It illustrated in the most visually dramatic way the doctrine that it was the Holy Trinity – represented by the triple-branched candlestick – that effected the Resurrection. It was a statement without words that Christ raised himself from the dead by His own Divine power. The Commission eliminated the ceremony of the triple candle with its Trinitarian symbolism and replaced it with a procession involving “active participation” of the laity, leaving it, as we shall see, with only secondary, if not exactly marginal, connections with the Resurrection. What this amounts to in practical terms is an attempt to censor or silence the liturgical expression of the doctrine of the Holy Trinity. It was a pattern that Bugnini replicated not only during the rest of the Holy Week reforms but also in the creation of the New Mass. As we have seen, their influence in the Liturgical Movement was beginning to make itself felt in the Holy Week reforms of Pius XII. We are, therefore, justified in raising the question: Did those members of the Commission who proposed reforms that accommodated the ideas of the neo-modernists hold the integral Catholic Faith? To ask the question is to answer it. Here, however, we are less concerned with the presumed intentions of the reformers than with the reforms themselves and their internal logic. Our brief is an objective examination of certain affirmations made by Fr. Antonelli in the “Memo” and the conclusions to which they logically lead. 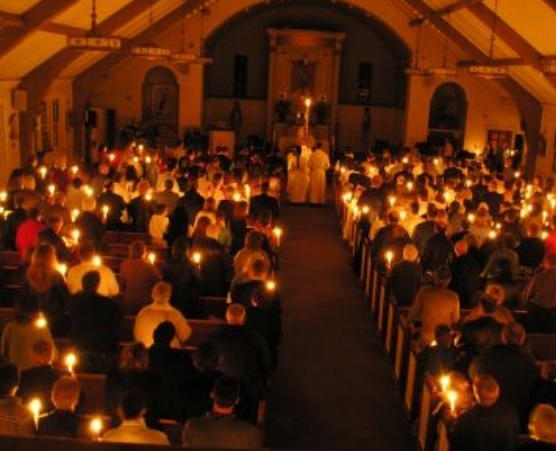 Thinking of the traditional Easter Vigil ceremonies as an orchestra playing a piece of classical music composed of different movements can help us to see how much damage was done by the 1956 reforms. But, when the reformers re-orchestrated the Procession in 1956, they cut out and added on whatever they pleased. By suppressing the triple-branched candlestick, they upset the balance and harmony of the “orchestra.” The tripartite candle had acted as a kind of masthead identifying itself as a symbol of the Holy Trinity and displaying the purpose of the Procession, which was to light the Paschal Candle. When it disappeared, the corresponding three-fold Lumen Christi and the three genuflections were left without their intended counterpart. 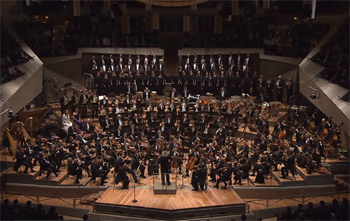 As the relationship between each instrument in an orchestra is one of complementarity, this fundamentally changed the combination of elements in the symphony. The effect was like trying to play Mozart’s Flute and Harp Concerto without, say, the flute. It would be a lopsided creation, a monument to organizational failure, because the sound would be off-balance and not ring true to the composer’s original intention. While it is inconceivable that any conductor would commit such a desecration, it transpired that the Commission actually accomplished something similar in the Easter Vigil with Bugnini at the podium. What the purpose of the reformed Procession was in relation to the Resurrection is unclear. The Paschal Candle was lit, but without ceremony, before the Procession began – a comparatively poor reception for the fact of the Resurrection and a definite anti-climax to the traditional rite. Then it was carried through the church so that everyone, without distinction of clergy or laity, could light their own individual candle from its flame. The whole process was not only an astonishing innovation in the Roman Rite, but also a considerable distraction from the main point of the Vigil, as it diverted attention away from the centrality of Christ to the people. The Paschal Candle, which was supposed to show the Light of Christ coming into the darkness of the world, was outshone by the constellation of candles in the hands of the laity illuminating the darkness far more effectively. Yet, this was not an oversight by the Commission. The new arrangement was chosen intentionally by the reformers to make the following point. The people, by merely holding a lighted candle, were encouraged to think of themselves as the bearers of the Light they had received at Baptism, as if it could never have been lost since then. What this reform shows is that the theologically unfounded optimism about human nature, which later surfaced at Vatican II, had entered the liturgy in the mid 1950s. For all the preceding centuries of its existence, the Church had wisely emphasized the frailty of human nature, its propensity to sin and its constant need for the Light. The theological modernists of the late 19th and early 20th centuries had been working to reinterpret and “demythologize” the Sacred Scriptures by explaining away the miracles and focusing on inner spiritual “experiences” instead of revealed truths. Consequently, their progressivist successors in the Liturgical Movement were determined to suppress the supernatural content of the liturgy and make it as man-centred as possible.